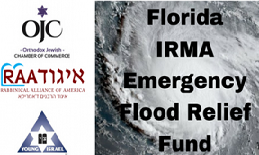 The Orthodox Jewish Chamber of Commerce is working hand in hand with several organizations and askanim to fill in the gaps and cover costs for immediate and Yom Tov needs for the South Florida Jewish community. Additional funds raised will go to help repairs for damages in shuls and homes. A multitude of South Floridian families, children and individuals are in need of immediate relief of food, water and repaired damages due to Hurricane Irma's devastating winds and week-long power outages, and Hurricanes Jose and Maria are right around the corner. Mark Rosenberg of Chesed Shel Emes and Dovi Katz of Tomchei Shabbos of Miami are literally working around the clock to provide basic essentials to individuals in need, such as food, water and generators. While they have the basics, they don't have extra necessities for the holiday, such as challas and bakery items. We are providing funding to cover the seemingly extra needs, which are, in fact, necessities for families for Yom Tov. Additionally, funds will help cover the construction costs for immediate repairs for homes and shuls, including the Young Israel of Sunny Isles. Our goal is to provide uprooted Irma victims with a safe place to grieve their losses and enjoy Rosh Hashanah celebrations. The Orthodox Jewish Chamber of Commerce, founded by Duvi Honig and represented by Devorah Wahl (co-founder and Director of Operations), the Rabbinical Alliance of America, represented by Rabbi Mendy Mirocznik, and National Council of Young Israel, represented by Farley Weiss, Esq. (NCYI President), Dr. Joseph Frager (NCYI Associate Vice President and OJC Vice President) and Rabbi Marc Volk (NCYI Executive Director), express their deepest concerns for the those affected by Hurricane Irma. Multiple synagogues are without electricity and have flooded from the storm's ceaseless rain and powerful surge. Many areas of the Jewish community, including where many elderly Jews live, are without power and may be so for weeks. Florida needs your help. We are receiving numerous phone calls every day just like the one below. Please donate to our project so we may provide the necessary means to rebuild the lives of the families, children and individuals affected by Hurricane Irma.